In honor of my girlfriend Kaylee getting her new job at the Hershey Factory, I decided I would learn about Milton Hershey and what he's done for this town. 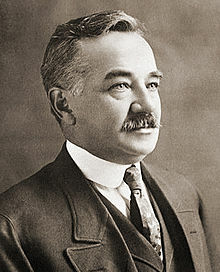 Milton Hershey was born on September 13, 1857 in Derry Township. His parents, Henry and Veronica were Mennonite and descendants of Swiss and German immigrant. Hershey grew up speaking Pennsylvania Dutch. Hershey's father had no work ethic but big dreams he couldn't achieve and after repeated failures of his ideas, Veronica had enough and they separated but never divorced. Because his father was gone and he was taking care of a farm with his mother, Hershey didn't get much schooling. He eventually dropped out all togther in 1871. At that time, he got an apprenticeship with a printer of a German-English newspaper. Hershey was terribly bored by this work and was fired after accidentally dropping his hat into one of the machines. His father spoke to the printer and Hershey was offered a second chance. Maddie Snavely, his aunt, suggested something better. She and Hershey's mother thought that he should go learn candy making. His mother found him an apprenticeship with a very experienced and renowned candy maker named Joseph Royer, and his factory was in Lancaster. Hershey learned quite a lot in his four years there and in 1876, he moved off to Philadelphia to start his own candy making business. Wanting to epanc, he tried going to Denver, where he learned even more about candy making. Here he learned he could put fresh milk in caramels to make them taste better. With the new knowledge, Hershey set forth in other big cities looking to start work but failing. His only successful venture was in New York City where he trained at Huyler's. He started a second business but it only lasted three years and was closed in 1886. At this time, Hershey returned to Lancaster and with his knowledge of adding milk to caramels and also selling them in bulk, he opened the Lancaster Caramel Company. This was his first extraordinary success. A man came from England who loved the caramels so much that he made a huge order to Britain which paid of the loans Hershey had taken out for this business and paid for more supplies and equipment. The company was very big, with over 1,300 workers and two factories. But after a trip to the World's Columbian Exposition in Chicago, he became intensely interested in producing chocolate. He took a huge risk by selling the caramel company for a million dollars which he used to open what would become a world famous Hershey Chocolate Company. Hershey found a nice piece of farmland near his birthplace in Derry Township. This way he would always have fresh milk for his chocolate. At the time, milk chocolate was a luxury item because mostly only the Swiss could make it and it excited Hershey that he might be able to supply it here and mass produce it. And through trial and error, he developed the perfect milk chocolate bar. Simply named the Hershey bar which was produced in 1900. Shortly after was the kiss in 1907 and the Hershey Bar with Almonds in 1908. The trademark foil on kisses was added in 1924. He planned a perfect model town for his workers with schools, churches, parks, recreational facilities and housing. He added a trolley system for the town as well, which you can still see at Hersheypark today. and later putting almost all of his assets, even control of the company to his new Milton Hershey School Trust. This was used to fund and the Industrial School. Later the school would accept girls and was renamed to the Milton Hershey School and I personally know people who benefited from that place. The Milton Hershey School Trust has complete control of Hotel Hershey, Hersheypark, and Hershey Entertainment and Resorts Company. His philanthropy would continue as long as he lived. In 1935, he made the M.S. Hershey Foundation which is a private charity which is still providing education and culture to the people of Hershey. They funded the Hershey Museum, Gardens and Theatre. After Hershey had passed away, the Milton Hershey School Trust created the Penn State Milton S. Hershey Medical Center, which was a gift from them to Pennsylvania. The Medical Center is a teaching hospital, which continues to greatly exceed the initial building cost with profit. Apparently, in 1912, Milton and his wife Kitty had purchased tickets on the RMS Titanic but because of a work concern that drew Milton away, they didn't go and lived to tell about it. The check Hershey signed is not win the Hershey Museum. Though Kitty was ill by this time, she would live two years longer and suffer an unexpected death. During the war, approximately three billion of the two military chocolate bars were made and distributed throughout the world! The plant was able to produce 100,000 ration bars every day in the year of 1939. The plant was making ration bars at the rate of 24 million per week! As a person living in Hershey, I have seen what a lovely place it is all these years later and I am impressed to think it all started with one man, with a big dream and a love of community and his workers. He truly is an inspiration. Hello everyone! Today is St. Patrick's Day so we going to learn about what St. Patrick did and why has a holiday! St. Patrick was born in England and brought to Ireland by slavers. He was a slave in Ireland for six years before he was able to return to his family. When he was leaving Ireland, he knew one day he would go back there. St. Patrick was ordained a priest after spending a long time in monasteries. Pope Celestine himself told St. Patrick to go to Ireland and spread the Catholic church to the pagan Irish. When Patrick got there he ran into a good deal of trouble trying to convert the Irish. The druids especially didn't want to give up their religion and Patrick and his church was a frightening. The Irish king never would convert to the church, although most of his family members did. Slowy but surely, the old pagan ways began to fade away. Patrick would go all over Ireland removing idols and temples and built cathedrals and churches. He built the first cathedral in Armagh in 444 AD. He baptized, confirmed and ordained new priests to help him spread the religion. He built catholic schools and monasteries. Patrick got all this done in less than thirty years, at which point all of Ireland was converted. He wrote a book called Confessions, which told his story. He died March 17th, 461 of natural causes. A man called Luke Wadding who was a scholar in Waterford living in 1588, is responsible for St. Patrick's death day to be a holy feast day. Now St. Patrick's Day is a national holiday for Northern and Southen Ireland. People use the day to celebrate being Irish and have traditional dishes such as Irish brown bread, corned beef and cabbage, beef and guiness pie, Irish cream chocolate mousse cake, Irish coffee, Irish potato champs, Irish stew or Irish potato soup. Aside from the good food, some more religious people may make a pilgrimage to St. Patrick's Purgatroy, a place for penance and spiritual healing. This is found on Station Island in the County Donegal. This place is where St. Patrick had a vision that anyone who would come to thata place would receive pardon for their sins. Happy International Woman's Day! I have finally remembered to continue my blog. Today we're learning about an exceedingly impressive woman! She was the first woman to sail a commercial ship and at the time she was nineteen and pregnant! 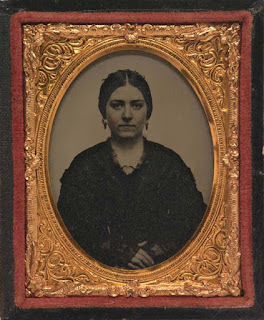 Her name was Mary Patten and she grew up in a family of mariners which she would later marry into when she married Joshua Patten, captain of the ship Neptune's Car. They had one sucessful and uneventful journey with the ship. Because in 1856, woman were considered bad luck on a ship but Joshua didn't want to leave behind his young wife, he got permission to let her aboard as well. The ship and five others had entered in a contest of between some shipping companies on which of their ships would arrive in San Fransico after making the same route to get there. And if they made a speedier delivery, they got a pay bonus as well. So when they began the immediate incompetence of the first mate William Keeler. Keeler would sleep on his shifts, refuse to put out the sails or something stupid like setting course through coral reef beds. He wasn't a useful guy. So, Joshua had the man shackled and isolated to his cabin. In the absence of a first mate, Joshua was worked to the bone, his second mate couldn't navigate and his third mate was illiterate, so with no one to help him, he had to do both shifts, always awake. He began to rely on his wife Mary to help him to navigate the ship. Due to his stress, lakc of sleep and undiagnosed turberculosis on top of the pneumonia he just got, he collapsed and was taken below deck. Mary was now doing everything. She read medical books, trying to learn how to help her ailing husband. She also took control of steering the ship, with help from the second mate to dock the ship to stay out of a very dangerous storm. Mary's husband was not doing well. The fever had reached his brain and he was partially blinded and deaf as well as incoherent. On top of all the trials Mary was dealing with, first mate Keeler tried to get the crew to mutiny, but luckily the crew was smart enough not to go for his silly idea. Joshua continued doing poorly and Mary continued to show her steel. She steered the ship though dangerous waters with glaciers falling apart, sheer piles of ice and incredibly bad weather. Joshua's fever broke and in a poor choice of judgenment despite apparently being lucid at the time, gave controls of the ship to the sneaky, and useless first mate. During the time Keeler was in charge, he wouldn't let Mary above deck, thinking she wouldn't know now that they were going off course. He had wildly underestimated Mary's abilities. She had made herself a compass from parts in the Captain's room and she told the captain about this, which led to Keeler being back in chains in his cabin and Mary back in charge where she belonged. At this point, Joshua relapsed and was completely deaf and blind for twenty-five days. Mary was now six months pregnant and she took complete control of the ship. They made it to their destination on November 15, 1856, a full 137 days after starting. Mary had captained for 56 of these days, in the terrible weather and without changing clothes for two months. And guess what? Their ship still beat all but one of the four boats they were in the friendly bet against to the port. With their arrival, Mary became quite the local celebrity, with many newspapers writing about her excapades. The ship's owners Foster & Nickerson refused to pay the captain's wages. All they received for their troubles and Mary's efforts to save cargo worth $350,000 was an insurance company giving Mary $1,000. But because she was a nice woman, she actually wrote them to thank them. There would be no happy ending for Joshua and Mary. Mary gave birth to her son Joshua Jr and was forced to put her husband in an asylum because he was doing so poorly. He would die there. And Mary herself would join him soon after. She had also contracted turberculosis and she died at the young age of twenty-three. Mary was buried next to her husband with a small bit of her story on her headstone. Though her name lives on through the U.S. Merchant Marine Academy in King's Point, NY when they opened a hospital. It was called Patten Hospital in memory of a woman whose strength and courage they wanted to continue to share. Hello everyone! Today I learned about a very interesting and badass woman of history! Her name was Pine Leaf, also known as Woman Chief and she was a warrior of the Crow Nation. When Pine Leaf was just a small, ten-year-old child, she was kidnapped by the Crow from her native tribe of the Gros Ventre. The story of her kidnapping has two possible versions. The first possible idea is that when she was kidnapped she talked her way out of being killed on the spot by claiming to have actually been kidnapped by the Gros Ventre recently and she got away with it by knowing some of their language. The other option is a Crow warrior was actually looking for a replacement for his deceased son. Whatever the truth is, she was raised to be strong and extremely good at everything. She learned to ride a horse, shot her bow and cleaning and carving a buffalo. She was a warrior who on her very first battle killed two enemies and herded some nearby wild horses because she wanted to. Pine Leaf was what the Native Americans call a two spirit, meaning she was a different gender from the usuals. Most two spirits wore masculine clothes but Pine Leaf did not. She always dressed like a woman. She promised not to marry until she killed 100 enemies. A man who lived with the Crow people in the 1880s named James Beckwourth claimed to have married this woman for five weeks but these claims are thought to be untrue. What was true was she married at least four women and did something the Natives called counting coup. This meant they would tease the enemy by doing something like running over the enemy unarmed and knocking the person over. She lead the tribe as the War Chief for twenty years. In 1851 the Treaty of Fort Laramie brought new jobs for the former war chief. 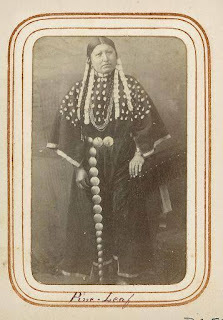 She helped in negotiations between the tribes of Upper Missouri and brought peace between her native tribe of Gros Ventre and her current tribe of the Crow. Unfortunately, after many years of peace, Pine Leaf was ambushed by the Gros Ventre and murdered. Hello everyone! Today I learned about a very amazing lady who made a huge difference during World War II and hadn't even been heard of until about 18 years ago! Her name is Irena Sendler, born Irena Krzyanowski in February of 1910 to her doctor father and his wife. Her father passed away due to typhus after treating some patients no other doctor would treat because they were afraid of catching the disease. Many of those patients were Jewish and as a thank you for her father's service, the Jewish community got together and paid for Irena to go to college. When at school, Irena saw they had a ghetto bench system in place, which I had to look up to find the meaning. Apparently, before World War II, Jewish students were forced to sit in a segragated section of the lecture hall on the left or face expulsion. Irena was agianst this so she defaced her grade card and was subsequently suspended from her university for three years. Irena moved to Warsaw before the start of World War II and she started working for Social Welfare departments at the municipal level. Shortly after the German invasion she began to aid the poor and destitute Jews. She was unable to continue her work when the Germans forced the Jews into a ghetto. But she found a way to get past this. With the help of her coworkers, they created 3,000 fake documents in order to continue to help the Jews. The group knew that if they were caught assisting the Jews, they would be put to death, but they believed so strongly in justice and freedom that they put their lives as secondary to the people they would help. There was an underground organization called the Council to Aid Jews and they made Irena, code name Jolanta, as the leader of the children's section. Since Irena was a social worker she was able to get access to the ghetto in order to check up on any disease that might be there. Under this guise, she and her coworkers smuggled out many Jewish children. Irena was arrested in 1943 but before she was caught she managed to put the names of all the children she saved into glass jars in her friend's garden. And she also secreted away money to help the The Germans tortured her, questioning her for the names of her fellows, she never gave in. She and the other women would make holes in the German's underwear while on prison laundry duty. The Germans found out and shot every other woman. She lived. She was still sentenced to death but her people bribed a German officer to let her go and so there were signs everywhere that she was to be shot. She lived again. In spite of the threats of her death, she didn't stop her important work. She was thought to be exectuted so she tried not to be seen. Even before the Zegota movement started, Irena had been helping Jewish families and they estimate she saved about 3,00 Polish Jews. When the war finally ended, Irena dug up the jars. She had hoped to reunite families after all this time but unforutunately, many of the family members had been gassed. So the children she saved went to be adopted either by Polish families or they went to Israel. Though she had been recoginized by the Polish people, the rest of the world knew nothing about her. Until in 1999 when some students from Kansas were given a newspaper clipping by their teacher about Irena and only one website had any mention of Irena. The children went on to learn all about her, even traveling to Poland and writing her when they learned she was still alive in 2000. The children put on a presentation called Life in a Jar which shares the life story of Irena. I'm glad that I was able to learn about her and the amazing work she did. Thanks to some kids in Kansas, there are tons of websites that talk about Irena and give her the fame she deserves. She passed away in 2008. Hello everyone! Today I bring another amazing woman to your attention! She was called Nicole Minet but her name was Simone Segouin. She was born in Chatres to a farming family with her father and three brothers, so she grew up in a man's world. 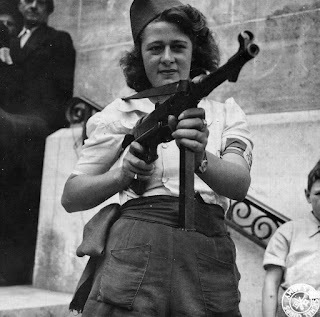 She was very passionate about the love she held for her country so when it was attacked int 1944, she joined a combat group called Francs-Tireurs et Partisans – which was a group made of communists and French nationalists. Simone was no communist. She wanted to protect her country. The group gave her a new name, protection for her family in case she was captured and new papers to go with it. She was now Nicole Minet and the first thing she did was steal a German's bicycle, her first mission. The bike was repainted and would be her transport for delivering messages and finding targets. Satisfied she could handle sneaking about and more dangerous things, she was given new missions. These included blowing up bridges, derailing a train and assisting in the capture of some Germans in Thivars. During the mission in Thivars, Simone met a man she fell deeply in love with. His name was Roland Boursier and he was a fighter who was in charge of the Thivars mission. When they met, Roland had to go into hiding in the country because he shot a large group of Germans. Roland couldn't give his place away so he asked Simone to help him by running messages back to the Resistance group. er for a while to see what her feelings were,’ Roland said during an interview after the war ended. ‘When I discovered she had French feelings I told her little by little about the work I was doing. I asked her if she would be scared to do such work. She said: ‘No, it would please me to kill Boche. A visit from General Charles de Gaulle who was the leader of the Free French at the time and would later be president, was when Simone was noticed by international journalists. General de Gaulle was headed to Paris and stopped to make a speech on the steps of the post office. 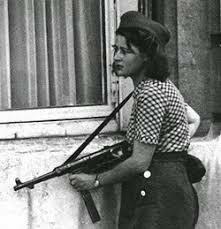 The journalists founded Simone eating a baguette with jam, holding her machine gun by her side and wearing her FTP armband. She was striking. There were so few women in the Resistance, they were impressed by the eighteen year old woman who was proud to be security for General de Gaulle. She was interviewed by an American reporter named Jack Belden and Robert Capa took several pictures of her which would be featured in a Life magazine titled “The Girl Partisan of Chartres”. Simone was part of the troops going to Paris with General de Gaulle as part of the 2nd Armoured Division. It was at six o'clock in the morning on August 25 that the Germans surrendered to the Allied forces. Just a month after, Simone's photographs were published in Life. At the time it was a multi-million reader circulation and these pictures made Simone into a legend. At the end of the war, Simone was awarded the Croix de Guerre as well as being promoted to lieutenant. The Croix de Guerre is a highly distinguished military honor the French receive. General George Patton said that the advance of Allied troops from Normandy woudn't have been possible without the FFI. Simone became a pediatric nurse in Chatres where she was born. She always knew how few women could be part of the Resistance and many never saw combat like she, but the ten percent of the Resistance that was women made a mark on how women would be treated. Women in France were first allowed to vote locally in April 29, 1945 and later in national one. Charles de Gaulle himself said that ‘women are voters and eligible under the same conditions as men’. The French Resistance in WWII helped a lot of things, like getting Germany out of France and helping win the war, but the women who helped in that made a difference for their fellows and we continue to move forward. Hello everyone! Continuing today to learn about the badass women in history , I bring you a pioneer of an industry in America! Maud Wagner was the first female tattoo artist in the United States. I'm very excited to tell you the little bit of her very interesting life that we know about. Maud was born in Kansas in 1877. As an adult, she worked in several traveling circuses. And during the St. Louis World's Fair while performing as a contortionist, acrobat and aerialist, she met a man named Gus Wagner. At the time they met, Gus was traveling in circuses and billed as the “Tattooed Globetrotter”. Gus worked using the old stick and poke method of tattooing and he asked Maud out on a date. She requested tattoo lessons in return. 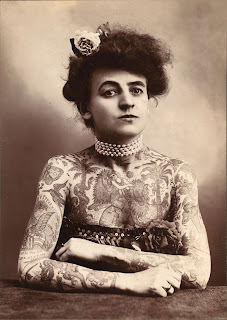 Maud loved to be tattooed, she became an actual attraction in the circus as an inked woman. At the time, seeing a woman in very little clothing and covered in tattooes was quite shocking! Maud also used the poke and stick method of tattooing even though machines were becoming more prevelant at the time. The two married and moved circus to circus and sometimes in vaudeville houses. They had a daughter named Lovetta who also learned to tattoo, although Maud wouldn't let her daughter be inked by her father and Lovetta said if her father couldn't, nobody could. In 1961, Maud passed away. She had continued to be one of the most interesting person, as one of few woman tattoists in America. She and her husband were also two of the only well known stick and poke artists. Lovetta passed away in 1983 but not before giving an traditional stick and poke tattoo to Ed Hardy. I hope everyone enjoyed learning about this awesome woman, I'm sorry it was a bit short today but I really got excited about this woman and I didn't have it in me to write a long blog because I had company today.